Berwick is a reputable, diverse and community-oriented neighborhood located in Columbus Ohio. Our neighborhood is bounded by Livingston Avenue to the North, James Road to the East, and Interstate 70 to the South and West. There are over 1,800 homes in Berwick, along with majestic tree lined streets, lakes and creeks, beautiful gardens, schools and businesses, churches and synagogues, and most importantly, friends and neighbors that call Berwick home. 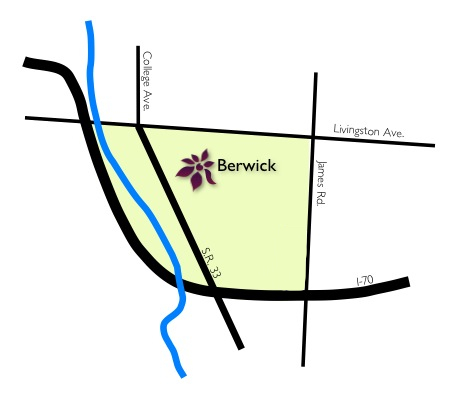 This website is intended to help inform the Berwick community of upcoming events and neighborhood concerns, link Berwick residents to community resources, and to inform individuals why Berwick is a great place to call home. Please explore the site and let us know what you think! We welcome your feedback, too! Please see the “Contact Us” link above.